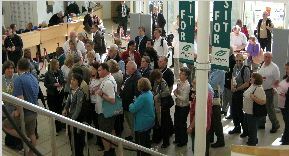 More people than ever came to the College on 13th November to enjoy the Friends’ 2010 annual Autumn Fair. 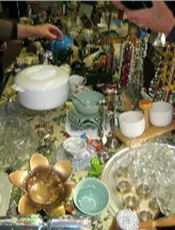 No fair would be complete without stalls giving the chance to win bottles and secret prizes, and buy books and homemade cakes. 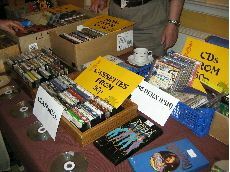 But visitors to the 2010 Autumn Fair were also delighted to find a wide selection of CDs, DVDs, video cassettes (right), jewellry and individually designed greetings cards, along with the hidden treasures of the bric-a-brac stalls (below left). 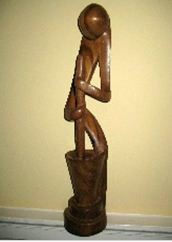 A unique piece was the South African sculpture (below right) which was the lot of a “blind” auction and on its own raised £25. Thanks to the generosity of the many donors and helpers, as well as the crowds of visitors, the Fair raised the magnificent total of over £1900 in just two hours! 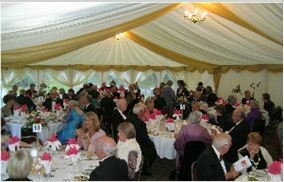 The Fair is the principal fund-raising occasion for the Friends of the College. Among their recent gifts are the splendid leather armchairs which now furnish the theological library. To read more about their work, click here. 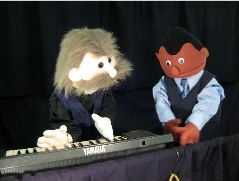 The Revd Neil Down, who first met the Warden at CRE in May visited the College on 16th October with Peter and Diane Hellyer of Upbeat Puppets. 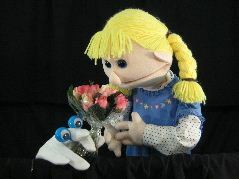 A moving moment came when a small finger puppet tried to bring consolation to a distraught girl (below right), who was eventually won over, not by his well meant gifts of flowers, chocolates or money, but of his love, revealing God’s love for her also. 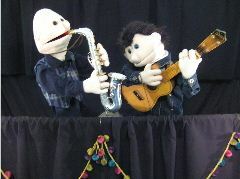 As well as entertaining the audience with a sequence of musical items, Peter and Diane spoke of how their ministry with puppets enables them to engage with a wide range of different groups. They also gave a brief demonstration of the practical techniques used in performance. Delighted to have visited the College, they are looking forward to returning, with Fr Neil of course, in 2011. On the day his appointment was announced, the newly chosen Bishop of Southwark, the Right Reverend Christopher Chessun, included the College in a hectic list of engagements throughout the Diocese..
Bishop Christopher knows the College well having served as Bishop of Woolwich, and was determined to include a visit here as soon as his new appointment was made public on 6th October. 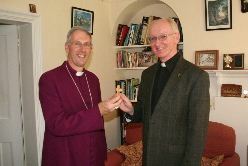 Bishop Christopher will be enthroned in the Cathedral as the 10th Bishop of Southwark early in 2011. To read more about his appointment, click here. 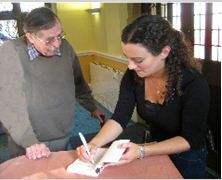 On 18th September, actress Abby Guinness captivated a packed audience as she delved into the stories of the great men of the Bible, through the eyes of the women who had to put up with them..
With monologues in the persons of people from both the Old and New Testaments, such as Mrs Zacchaeus, Mrs Potiphar and Miss Shepherd (right), she reflected on the transforming power of the Christian faith. The audience were clearly moved by the tragedy and frustration of Mrs Pilate, whose plea to her husband went unheeded, and the clergy wives in the audience especially rejoiced in the satirical comments of Mrs Caiaphas. After the performance, enthusiastic members of the audience were able to meet Abby and share their own experiences in ministry. They were also able to buy copies of her book, The Word of the Wives (below right), from which the monologues are taken. 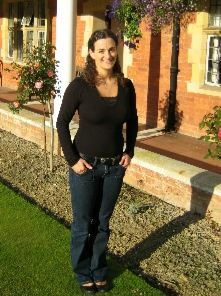 More information about Abby’s work can be found on her website, www.livingandactive.co.uk . 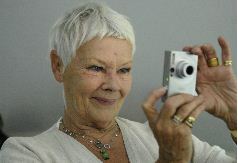 Dame Judi Dench – Photographer! College Patron Dame Judi Dench paid a lightning visit on 2nd September to lend her support to our part in Legacy Awareness Week.. The international star took a series of photographs that will feature in the Legacies Through a Lens exhibition, organised by Remember A Charity, which takes place at the Oxo Tower on London’s South Bank. 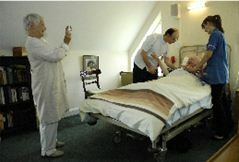 Dame Judi was delighted to fit the “photoshoot” into her hectic schedule as she wanted to demonstrate her admiration for and commitment to the life of the College. 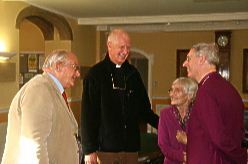 Meeting Residents and photographing them for the exhibition, Dame Judi was impressed with the stories of their ministry. The exhibition will run from 13th to 20th September before touring throughout the country. To find out more about the work of Remember A Charity, click here. 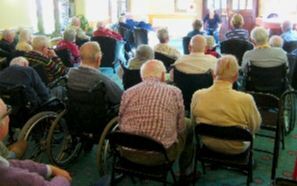 In a week of lively activity, groups of Residents from the College made two important visits in mid-July.. The arts and crafts cake! 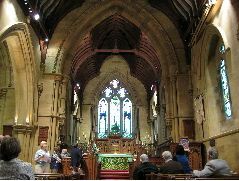 The stained glass windows in Speldhurst Church are famous for their beautiful designs by Edward Burne-Jones and William Morris. 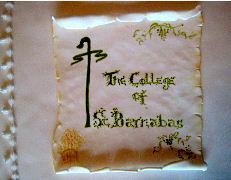 On Wednesday 14th July, the Friends of the College arranged a private tour of the church, followed by a generous garden tea which even included a cake decorated in Arts and Crafts style with the name and emblem of the College. 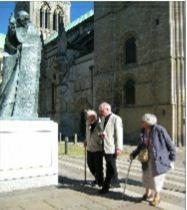 Sunday 18th July saw the second College pilgrimage of the year, this time to the Shrine of St Richard of Chichester. As well as enjoying an excellent lunch and a personal tour of the Cathedral, the group attended Choral Evensong for the conclusion of the Southern Cathedrals Festival before making a final visit to the Shrine itself. 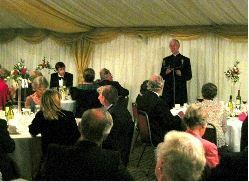 The Dean of Canterbury, the Very Revd Robert Willis, was the Guest Speaker at the 2010 Annual Dinner.. 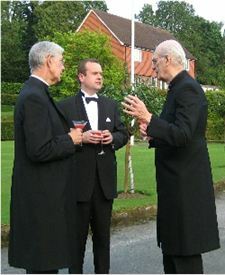 The Dean, who is a President of the College, was joined for cocktails before the meal by residents and guests, including two College Patrons, the Lord Lieutenant and Mr Peter Ainsworth. The audience were enthralled as the Dean spoke of the value of the College community, and compared it with the historic community of Canterbury Cathedral. Ranging through Gilbert and Sullivan and Haydn, he reflected on the life of the Cathedral through turbulent times as reflected in the portraits of the Deans which hang in the Deanery. The College, he said, was a similar community where stability and care could be found by all who live here. The Dean’s speech was followed by a raffle and auction which, thanks to the generosity of those present, raised a further £2000 to support the work of the College. The evening ended with the announcement by the Warden that the speaker at the 2011 Festival Dinner, on Friday 10th June, and will be the Dean of St Paul’s, the Rt Revd Graeme Knowles. Preacher: The Rt Revd John Pritchard, Bishop of Oxford. When Paul and Barnabas came to Lystra the crowds shouted, ‘The gods have come down to us in human form.’ Strangely that’s never happened to me! Of course it helped that Paul had just healed a man crippled from birth, and my arrival in Oxford was a little less dramatic. Mind you, I wasn’t taken in by something written by a predecessor of mine in the 1830s who said, ‘I took this diocese solely because of its smallness, quietness and the little anxiety it need give me.’ That’s not how I’d describe the diocese of Oxford today! Indeed another predecessor, Bp Patrick Rodger, was once standing in the loo in our Diocesan Church House (like you do) and he said to the man standing beside him, ‘You know, I think this is the only time in my life when I really know what I’m doing, and when I stand a pretty good chance of finishing the job!’ I know what he meant! Ministry is complicated, the social context is bewildering, public understanding of what we’re about is at an all time low. And yet… all is well. Because God is well. Paul and Barnabas came to Lystra with a clear goal – to proclaim Jesus Christ as Lord. Unfortunately, having to stop and heal someone led to that bit of misunderstanding I mentioned before – they were mistaken for the two deities worshipped locally, Zeus and Hermes. Only 50 years before, the poet Ovid had told the story in his Metamorphoses of these two gods visiting the country nearby, disguised as mortal men, and being rejected time and again as they looked for somewhere to stay – until an old peasant couple took them in. This couple eventually got rewarded, but all the other homes got destroyed by the gods. Not unnaturally, the locals were now rather keen not to repeat that mistake, so they went out of their way to welcome these two men with god-like powers. ‘These worthless things.’ We seem to have got the price labels all mixed up. The worthless things like glamour, celebrity, and ruthlessness are given hugely inflated price tags; the truly valuable things like love, courage, mercy and so on, are put in the corner marked ‘reduced to clear’. Now, I shall be as plugged in to the World Cup as anyone, but I can’t help but be flabbergasted by the thought of Steven Gerrard being paid £125,000 a week just to play a game. A week! Do you remember your last monthly pay cheque from the Church Commissioners? Football has gone crazy. I used to know the England captain of the 1960s, Jimmy Armfield, and he never got more than £70 a week from his club even when he was captaining England. But now we’ve got the price tags all mixed up. ‘The worthless things’. All this confusion over what’s valuable has led to anarchy over what’s wise, as we try to live together in society. Charles Saatchi, the advertising guru, has written a book recently in which he offers his opinions on various questions, and he gives this evaluation of the Ten Commandments: ‘It’s an overrated lifestyle guide, unsustainable and largely ineffective, only succeeding in making people confused and guilty.’ When asked about which of the seven deadly sins he is guilty of he replies: ‘All of them. And they’re far from being sins. Rather, they’re all very uplifting and create a balanced and engaged life.’ I think Paul would say, as he did in 2 Cor.4, ‘The god of this world has blinded the minds of the unbelievers.’ Charles Saatchi is in a very bad place. Paul and Barnabas said, ‘We bring you good news, that you should turn from these worthless things to the living God who made the heaven and the earth…’ That’s so deeply refreshing, isn’t it? ‘Turn to the living God.’ Set your compass on the true and living God, and then you’ll be able to read off north, south, east and west; you’ll be aligned with reality; you’ll know the true value of things; you’ll know what your life is for. It’s interesting though, isn’t it, that Paul and Barnabas (we don’t know which of them was speaking; probably Paul) – Paul says that their hearers should turn to the living God, maker of heaven and earth, seen in the rain, and the fruitful seasons, and filling their stomachs with food and their hearts with joy. Paul doesn’t speak immediately of Jesus; he starts where they are, people without the benefit of the Hebrew scriptures which he would use as his starting point elsewhere. But here he starts with the natural world around them. That too witnesses to God’s kindness, he says. There’s the book of scripture and the book of nature. It was five in the morning and the night had been bitterly cold. But then, at Annapurna base camp in the Himalayas, what could one expect? I’d slept in several layers of clothing in a four seasons sleeping bag with only my nose poking out, but I was still cold and glad to get moving. Dawn was casting a calm light into our wooden hut. 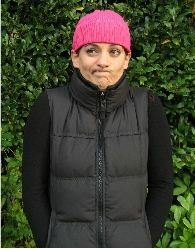 I struggled into yet more clothes and icy boots, and then went outside. It was only a hundred yards up the slope to the moraine we hadn’t been able to see the night before when we arrived in the steady snowfall, but I knew this was the vantage point we needed. When I got there I looked up and if I hadn’t already been silent in the early dawn I would have been struck dumb. Around me were at least ten peaks which stood over 20,000 feet high. The distances were disconcerting but these giant sentinels stood guard all around us – not for nothing is it called the Annapurna Sanctuary. The peaks glowed pink in the dawn light and their massive silence was overwhelming. Above all I was awestruck by the scale of these majestic mountains. My idea of a mountain was shaped by the Lake District peaks where Scafell Pike is the highest at just 3209 feet. These around Annapurna were off the scale. Paul was flexible in his style of preaching and his way of talking about the gospel. Would that we had that same gracefulness. So often different parts of the Church have wrapped the gospel up in little boxes with plain or multi-coloured paper, according to taste, and told the rest of the world that this is the take-it-or-leave-it true gospel, never to be contaminated by the world. ‘You mean, like Jesus?’ I want to ask.’ The Jesus who got his hands dirty in the soil of creation and the soil of people’s lives. And it’s to this Jesus that Paul and Barnabas would have pointed people eventually, if they’d had the chance. Unfortunately, Jewish protesters came from Antioch and Iconium and chased them out of town. They went on to Derbe, but then, astonishingly after the way they’d been treated, they just went straight back in to Lystra and proclaimed the good news of Jesus Christ and, we’re told, made many disciples. What a couple! ‘Turn from these worthless things to the living God.’ It’s the turn that matters. We live in such a proud age that people don’t want to turn. I have a cartoon of a man pushing a loaded supermarket trolley up a mountain path, followed by a disconsolate wife. The caption said, ‘Having insisted this was the way back to the car, Paul is unable to admit that he is wrong.’ That’s today’s story. The gospel says, turn, turn, turn; all the joy of God awaits you. Here was a man who understood the complex simplicity of faith and who knew, for all his intellectual ability, that at its heart faith is a matter of turning afresh to Christ every day and seeking to put him at the centre. That’s what I trust we will all do, to the end of our days. 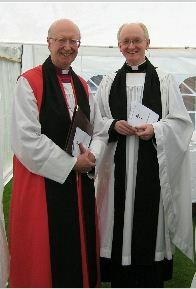 The Right Reverend John Pritchard joined nearly 200 worshippers to preach at the 2010 Patronal Festival Evensong..
Making his first visit to the College, Bishop John found himself among old friends. 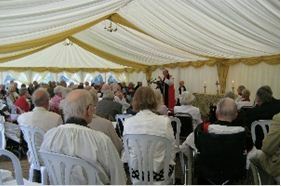 After Evensong in the marquee (too many people attend this occasion to fit into the Chapel) the furniture was hastily re-arranged despite the rain and the Bishop took tea with Residents and friends. He was so delighted by what he found that he readily agreed to join the ranks of the Presidents of the College – public figures from the Church and beyond who are committed to being ambassadors for the College. 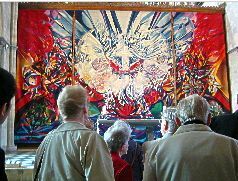 A painting of the mystery of Pentecost took its place in the College on Whit Sunday, 23rd May 2010.. 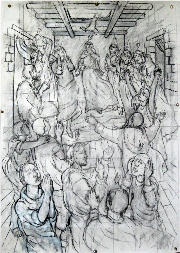 When artist James Lynch visited the College to see the hanging of his Stations of the Cross, he offered his existing painting of the Coming of the Holy Spirit to be positioned after the depiction of the Resurrection. But it wouldn’t fit in the intended space! So James spontaneously offered to paint a new picture for the College of the moment when, with the sound of a rushing mighty wind, things which looked like flames alighted on the disciples as the Holy Spirit was poured upon them. With the agreement of the Friends to fund the project, work began in Spring 2009. 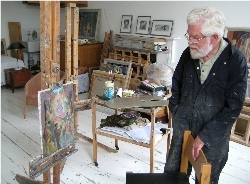 By the summer the preliminary sketches were complete and James had embarked on a small colour study before starting work on the full size canvas. 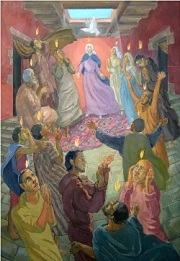 The picture was complete in time for the great Festival of the Holy Spirit, when it was blessed by the Warden at the end of Mass.